For the 1998 film, see Patch Adams (film). 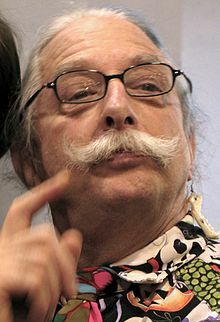 Hunter Doherty "Patch" Adams (born May 28, 1945) is an American physician, comedian, social activist, clown, and author. He founded the Gesundheit! Institute in 1971. Each year he organizes a group of volunteers from around the world to travel to various countries and they dress as clowns in an effort to bring humor to orphans, patients, and other people. Adams is currently based in Urbana, Illinois. In collaboration with the institute, he promotes an alternative health care model not funded by insurance policies. Adams was born in Washington, D.C., the son of Anna Campbell Stewart (née Hunter) and Robert Loughridge Adams. His maternal grandfather, Thomas Lomax Hunter, was the Poet Laureate of Virginia. His father, an officer in the United States Army, had fought in Korea, and died while stationed in Germany when Adams was only 16. After his father's death, Adams returned to the United States with his mother and brother. Adams has stated that upon his return he encountered institutional injustice which made him a target for bullies at school. As a result, Adams was unhappy and became actively suicidal. After being hospitalized three times in one year for wanting to end his life, he decided "you don't kill yourself, stupid; you make revolution." After graduating in 1963 from Wakefield High School, Adams completed pre-med coursework at George Washington University. He began medical school without an undergraduate degree, and earned his Doctor of Medicine degree at Virginia Commonwealth University (Medical College of Virginia) in 1971. In the late 1960s one of his closest friends (a man, not a woman as depicted in the Patch Adams film) was murdered. Convinced of the powerful connection between environment and wellness, he believes the health of an individual cannot be separated from the health of the family, community, and the world. While working in an adolescent clinic at MCV, in his final year of med school, he met Linda Edquist, a fellow VCU student who volunteered in the clinic. Adams and Edquist married in 1975 and had two sons, Atomic Zagnut "Zag" Adams and Lars Zig Edquist Adams; they divorced in 1998. Soon after graduation, Patch, Linda, and friends founded the Gesundheit! Institute (originally known to many as the Zanies), which ran as a free community hospital from 1971 to 1984. A revamped Gesundheit! Institute, envisioned as a free, full-scale hospital and health care eco-community, is planned on 316 acres (128 ha) in Pocahontas County, West Virginia. Its goal is to integrate a traditional hospital with alternative medicine, with the organization developing educational programs in sustainable systems design targeted to medical students and the general public. Since the 1990s Adams has supported the Ithaca Health Alliance (IHA), founded as the Ithaca Health Fund (IHF) by Paul Glover. In January 2006 IHA launched the Ithaca Free Clinic, bringing to life key aspects of Adams' vision. Adams has also given strong praise to Health Democracy, Glover's book written and published the same year. In October 2007, Adams and the Gesundheit Board unveiled its campaign to raise $1 million towards building a Teaching Center and Clinic on its land in West Virginia. The Center and Clinic will enable Gesundheit to see patients and teach health care design. Adams urges medical students to develop compassionate connections with their patients. His prescription for this kind of care relies on humor and play, which he sees as essential to physical and emotional health. Ultimately, Adams wants the Gesundheit! Institute to open a 40-bed hospital in rural West Virginia that offers free, holistic care to anyone who wants it. Adams was awarded the Peace Abbey Courage of Conscience Award on January 29, 1997. In 2008, Adams agreed to become honorary chair of the "International Association for the Advancement of Creative Maladjustment" or IAACM. MindFreedom International, a nonprofit coalition that Gesundheit! belongs to as a sponsor group, launched the IAACM to support "creative maladjustment" and social change. Adams still leads trips to cheer kids up all over the world. He also teaches at one session of Wavy Gravy's circus camp Camp Winnarainbow. The 1998 film Patch Adams was based on Adams' life and views on medicine. Adams has heavily criticized the film, saying it eschewed an accurate representation of his beliefs in favor of commercial viability. He said that out of all aspects of his life and activism, the film portrayed him merely as a funny doctor. Patch Adams also said of Robin Williams in an interview, "He made $21 million for four months of pretending to be me, in a very simplistic version, and did not give $10 to my free hospital. Patch Adams, the person, would have, if I had Robin's money, given all $21 million to a free hospital in a country where 80 million cannot get care." However, in another interview, Adams did clarify that he did not dislike Williams, stating "I think Robin himself is compassion, generosity and funny. I like to think that that's who I am, and so I think he was the only actor I wanted to play me, and I think he did a fabulous job." Williams also had actively supported St. Jude Children's Research Hospital for several years. Upon hearing of the death of Robin Williams, he released this statement. The terrible news of the passing of Robin Williams reached me here in the Peruvian Amazon late Monday night with tremendous sadness. Surrounded by over 100 friends and clowns on our annual clown trip, we mourn this tragic loss and continue to treasure his comic genius. Robin Williams was a wonderful, kind and generous man. One important thing I remember about his personality is that he was unassuming—he never acted as if he was powerful or famous. Instead, he was always tender and welcoming, willing to help others with a smile or a joke. Robin was a brilliant comedian—there is no doubt. He was a compassionate, caring human being. While watching him work on the set of the film based on my life—Patch Adams–I saw that whenever there was a stressful moment, Robin would tap into his improvisation style to lighten the mood of cast and crew. Also, I would like to point out, Robin would be especially kind toward my children when they would visit the set. Contrary to how many people may view him, he actually seemed to me to be an introvert. When he invited me and my family into his home, he valued peace and quiet, a chance to breathe—a chance to get away from the fame that his talent has brought him. While early in life, he turned to drug use and alcohol to escape, he replaced the addiction with moments of solitude to help cope with the stress that fame brought. This world is not kind to people who become famous, and the fame he had garnered was a nightmare. While saddened, we are left with the consequences of his death. I'm enormously grateful for his wonderful performance of my early life, which has allowed the Gesundheit Institute to continue and expand our work. We extend our blessings to his family and friends in this moment of sadness. Thank you for all you've given this world Robin, thank you my friend. The 2003 Bollywood film Munna Bhai M.B.B.S. was inspired by the movie and brought Adams's methods to the forefront in India and Pakistan where conventional methods were predominant. As a speaker, Adams travels around the globe lecturing about his medicine methods. Adams, Patch; Maureen Mylander (1998). Gesundheit! : Bringing Good Health to You, the Medical System, and Society through Physician Service, Complementary Therapies, Humor, and Joy. Rochester, Vermont: Healing Arts Press. ISBN 978-0-89281-781-8. Adams, Patch (1998). House calls. Cartoons by Jerry Van Amerongen. San Francisco: Robert D. Reed Publishers. ISBN 978-1-885003-18-8. Adams, Patch; Maureen Mylander (1998). Gesundheit! [sound recording]. Los Angeles: NewStar Media. ISBN 978-0-7871-1828-0. Retrieved December 16, 2008. 4 sound cassettes (ca. 6 hr.) : digitally mastered, Dolby processed. Adams, Patch (1998). House calls. cartoons by Jerry Van Amerongen. San Francisco: Robert D. Reed Publishers. ISBN 978-1-885003-18-8. Retrieved December 16, 2008. Bourque, Judith (1999). The real Patch Adams (videorecording) / a film by Judith Bourque. Oley, PA: Bullfrog Films. ISBN 978-1-56029-811-3. Retrieved December 16, 2008. 1 videocassette (53 min.) : sd., col. ; 1/2 in. John Graham for the Giraffe Heroes Program (1999). It's up to us. foreword by Patch Adams. Langley, Washington: Giraffe Project. ISBN 978-1-893805-00-2. Retrieved December 16, 2008. ^ a b c "Doctor in a Clown Suit Battles Ills of His Profession". New York Times. December 15, 1998. ^ "Kenneth-A-Graybeal-Bellevue - User Trees - Genealogy.com". ^ "The Free Lance-Star - Google News Archive Search". ^ "Alumni News Wakefield High School" (PDF). Fall 2008. p. 5. Retrieved September 12, 2009. ^ "The Peace Abbey Courage of Conscience Recipients List". Archived from the original on June 12, 2010. Retrieved July 17, 2009. ^ "MindFreedom International launches IAACM". Retrieved July 17, 2009. ^ a b "Real Patch Adams – Movie True Story". Chasingthefrog.com. January 2, 2012. ^ "Get Involved with St. Jude Children's Research Hospital". ^ Adams, Patch (August 12, 2014). "Patch Adams: 'Thank You for All You've Given This World Robin, Thank You My Friend'". Time. ^ "Patch Adams - Book for Speaking, Events and Appearances". November 11, 2015. 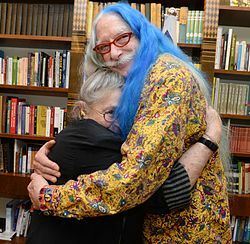 Wikimedia Commons has media related to Patch Adams. This page was last edited on 19 March 2019, at 19:30 (UTC).